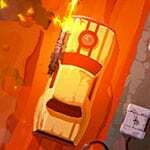 Furious Road is a car survival game where your drive your armor car across a post apocalyptic world. Use machine guns and launch your rockets at anyone that get in your way, improve your weapons and over time. Avoid incoming bullets. Get into your armored vehicle and patrol the dusty roads, full of crime and hate. Kill all enemies that try to attack you, with your powerful machine gun or rocket launcher. Drive carefully, avoid enemy shots and collect power-ups to increase your car’s abilities. Earn money to upgrade your weaponry. So would you be able to be a good driver and kill all enemies? Enjoy and have fun in playing Furious Road Game. Also make sure to check out Avengers Tower Rush, SWAT 3 Game, Shadow Archers, Skate Hooligans and Chronicles of Nerdia Game. We picked up these games from our action games. So have fun.